Since 1991, LIDDELL TALENT MANAGEMENT has been keenly aware of the wide diversity of audiences' tastes, as well as their expectations for the best, in whatever genre that they decide to leave the comfort of their homes to see. For that reason, we have searched for both diversity and quality, in all of the performers we are proud to represent. We also try to make it easier on the presenter, by helping them to fill all of their entertainment needs (all our entertainers are anxious to perform "residencies" and "outreaches" when requested), with only one contact (if we don't represent an act that is desired, we will do all in our power to locate it through our many sources). We have learned, over the years, to put the audiences' and buyers' needs as our paramount concern! Give us a chance to prove it!!! MAD CHAD TAYLOR - "Juggling Evil Knievel of Comedy"
"PATRICK MURRAY" - Ventriloquist and "Matilda, Caribbean Queen Of Comedy"
Hilton Hotel (at 54th Street), 1335 Avenue of the Americas, New York, NY 10019. 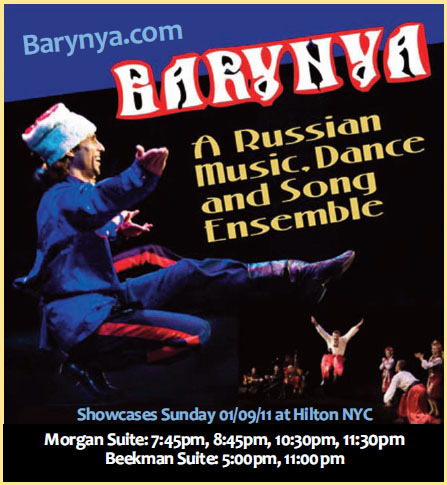 Ensemble Barynya will presents Russian, Cossack, and Ukrainian traditional dance, song and music with live accompaniment of balalaika, balalaika-contrabass, and garmoshka (Russian button accordion). The program will be performed by 6 dancers, 3 musicians, and singer. Liddell Talent Management is a member of Arts Northwest, WAA, NAPAMA, Arts Midwest, APAP, PAE, BC Touring, California Arts Council on Tour, IEBA. ©2003-2007. Liddell Talent Management. All rights reserved.